If background stars are uniformly distributed, the number of stars with is proportional to the area which satisfies . That is, if we plot against , this gives the number distribution of background stars with . Figure 1.25 shows the result of L977 dark cloud by Alves et al (1998). Recently, Alves et al (2001) derived directly the radial distribution of by comparing the model distribution for B68. They obtained a distribution is well fitted by the Bonner-Ebert sphere in which a hydrostatic balance between the self-gravity and the pressure force is achieved (lower panels of Fig.1.25) (see section 4.1.1). Figure 1.23: Schematic view to explain an distribution. Figure 1.24: (Left:) Radial intensity profiles of the environment of 7 embedded YSOs (a-g) and 1 starless core (h).  (Right:) Same as left panel but for 4 isolated globules (a-d) and 4 Perseus protostars (e-h). Taken from Motte & Andre (2001). Figure 1.25: Density distribution of L977 (top) and B68 (bottom) dark clouds. 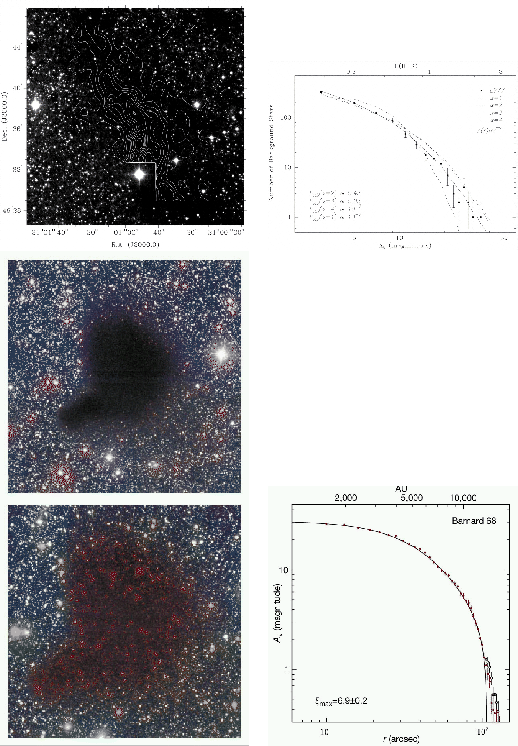 (Top-left:) L977 dark cloud dust extinction map derived from the infrared (H-K) observations. (Top-right:) Observed frequency distribution of extinction measurements for L977 and the predictions from clouds models with density structures having (dashed line), 2 (solid line), 3 (dotted line), and 4 (dash-dotted line). (Bottom-left:) B68 images (false color images made from B, V, and I images (top), and B, I, and K images (bottom)). (Bottom-right:) Spatial distribution of the column density. In this fields, we should pay attention to the density distribution in cylindrical clouds. As seen in the Taurus molecular cloud, there are may filamentary structures in a molecular cloud. In 4.1, we will give the distribution for a hydrostatic spherically symmetric and that of a cylindrical cloud. The former is proportional to and the latter is . Therefore, the distribution was expected for cylindrical cloud. 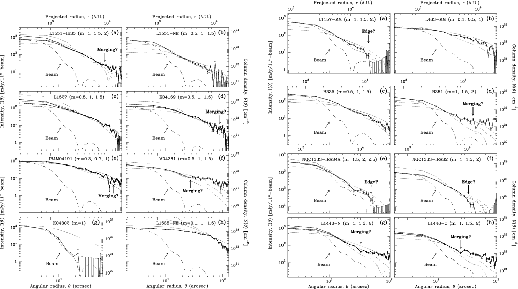 From near IR extinctions observation (Alves et al 1998), even if a cloud is rather elongated [Fig.1.25 (top-left)], the power of the density distribution is equal to not -4 but . Fiege, & Pudritz (2001) proposed an idea that a toroidal component of the magnetic field, , plays an important role in the hydrostatic balance of the cylindrical cloud (Fig.1.26). Figure 1.26: A structure of magnetic fields in the L1641 region. Polarization of light from embedded stars (Vrba et al. 1988) is shown by a bar. The direction of magnetic fields in the line-of-sight is observed using the HI Zeeman splitting, which is shown by a circle and cross (Heiles 1989).